REDWOOD CITY, Calif., Aug. 16, 2017 /PRNewswire/ -- Equinix, Inc. (Nasdaq: EQIX), the global interconnection and data center company, today announced the signing of a 15-year Power Purchase Agreement (PPA) between a subsidiary of Southern Company and Equinix in which Bloom Energy fuel cells will be installed at 12 International Business ExchangeTM (IBX®) data centers in the U.S. The project will provide a total capacity of more than 37 megawatts of power with a phased installation that begins in late 2017 through 2019. The new project will install fuel cells at seven Equinix IBX data centers in the Silicon Valley (SV1, SV2, SV3, SV4, SV5, SV6, SV10), three in the New York area (NY2, NY4, NY5) and two in the Los Angeles area (LA3, LA4). It builds on the pilot program at Equinix's Silicon Valley SV5 IBX data center that began in 2015. This investment is a key milestone in Equinix's corporate sustainability program which focuses on making a positive impact on the company's employees, the communities in which it operates and the environment. The project is financed through Southern Company and reflects a strategic partnership between Bloom Energy and Southern Company to support on-site fuel cell solutions. 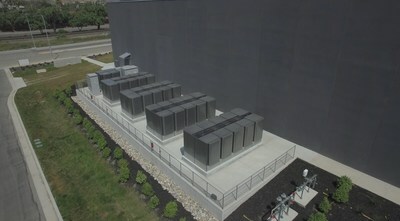 With the existing fuel cell at the SV5 IBX, and existing fuel cell installations at two IBXs acquired from Verizon this year (LA7 and NY13), the new project will bring Equinix to a total of more than 40 megawatts of fuel cell provisioned power at 15 locations. Once installed and operational, the Equinix fuel cell project will operate at world leading efficiency, providing power that is 20-45 percent cleaner than the equivalent utility provided natural gas powered generation. Over the lifetime of the project, this will avoid 660,000 tons of carbon emissions and save 87 billion gallons of water that would have been used by natural gas or coal-fired utility generation. In addition to the significant sustainability impact, the project provides 24 x 7 always-on, highly reliable power optimally matched to the operational requirements of the data center. This project will relieve the day-to-day stress on local utility providers, helping to delay new utility generation and providing electricity directly where it is needed. Equinix recently released its second annual Corporate Sustainability Report that includes a review of progress towards Equinix's long-term goal of using 100 percent clean and renewable energy, as well as progress toward Equinix's other goal of growing a responsible and sustainable company. As of 2016, Equinix had achieved 56 percent renewable energy coverage worldwide. In addition to these fuel cell initiatives, Equinix is also engaged in Power Purchase Agreements for wind energy from Oklahoma and Texas, providing a total of 225 megawatts of capacity. Bloom Energy fuel cells use a proprietary solid oxide technology to generate electricity through a clean electrochemical process using air and fuel and resulting in only water and a small amount of carbon dioxide as by-products. SOx (sulfur oxides), NOx (nitrogen oxides) and other harmful smog-forming particulate emissions are virtually eliminated with the use of Bloom Energy fuel cells. "As Equinix data centers, and the interconnection they facilitate, become increasingly critical to the infrastructure of our digital world, this fuel cell expansion is one step in lessening the overall impact of the digital economy on the planet. It enables us to serve our customers with the highest levels of performance while assisting their efforts to make their supply chain clean and efficient." "There is no greater compliment and validation of our energy platform than to have our existing customers continue to expand their deployments of Bloom Energy Servers, and today, Equinix is doing that in a big way." "Our strategic partnership with Bloom Energy was established to deliver greater value for customers by providing innovative energy solutions directly on the customer premise. This project with Equinix further demonstrates that this approach is meeting the smart energy demands of today's leading companies."